The Model 7900HT and QuantStudio Flex 7(QS-7) instruments have interchangeable blocks that permit the running of 96- and 384-well formats, as well as, the TaqMan Low Density Array (TLDA) cards. Each instrument has a wavelength detection of 500-660 nm allowing for multiple chemistry detection including TaqMan probes and SYBR Green intercalating dyes. Applications include quantitative Reverse Transcriptase PCR (qRT-PCR) and Single Nucleotide Polymorphism (SNP) detection. Access to the real-time instrumentation is first gained by making a reservation using the on-line calendaring system. The investigator then brings their plate, ready to load on the instrument, along with their completed real-time PCR request form (printed after making your reservation) prior to their reservation time. Results are provided via email or can be transferred to a portable drive provided by the investigator. The IIHG Genomics Division provide digital PCR (dPCR) services using the Bio-Rad QX200™ Droplet Digital™ PCR System. Digital PCR is a technology that provides the ability to perform ultrasensitive and absolute quantification of nucleic acid targets. 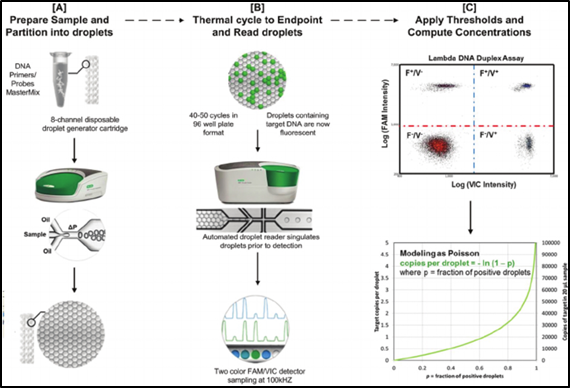 While Droplet Digital PCR (ddPCR) system can use the same Hydrolysis probe (Taqman)- or EvaGreen (SYBR-like)-based assays, it gives the ability to quantify template molecules that may be undetectable using the traditional real-time PCR techniques. Also unlike qPCR, there is not a need to generate a standard curve since ddPCR simply counts the number of target molecules contained in the sample as the results are expressed as copies per microliter. As stated above, the ddPCR technique is particularly useful for low abundance targets, targets in complex backgrounds, allelic variants (SNPs) and for monitoring of subtle changes in target levels. Each molecule of DNA/RNA contained sample is partitioned into a large number of nanoliter sized droplets prior to amplification (Fig 1). Each droplet becomes an individual PCR reaction. After end-point amplification, fluorescence is detected in the droplets in which target sequence was amplified. These droplets are scored as positive. Droplets not containing the target sequence show little or no fluorescence and are scored as negative. Using the Poisson distribution law, the fraction of positive droplets is converted to the number of molecules in the starting sample, without the need for standard curves (absolute quantification).